By Natalie Zmuda . Published on January 25, 2012. 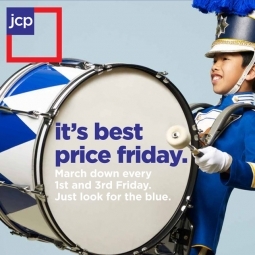 JC Penney is ripping up the marketing playbook and starting fresh. Over the course of a two-hour presentation on Manhattan's West Side today, JC Penney CEO Ron Johnson and President Michael Francis outlined a series of major changes across all aspects of the department store's pricing, promotion, presentation and products. Changes will be unveiled to consumers on Feb. 1. Among the items: The retailer introduced a new logo as well as a new spokeswoman, Ellen DeGeneres, who joined the proceedings via a recorded comedic video. Martha Stewart was there in the flesh to discuss her partnership with the retailer. A new line from designer Nanette Lepore was announced. And Mr. Johnson teased attendees with a brief discussion of a new JC Penney prototype to launch in 2014 and "heavily informed" by his alma mater, Apple . It was an impressive spectacle. "Just like Apple , we're going to learn that the best days aren't in the rear-view mirror, they're right down the road," Mr. Johnson said, noting JC Penney is 110 this year. "I believe the department store is the No. 1 opportunity in American retail. And this isn't something I decided last June when I took the job. This is something I decided 10, 15 years ago." Mr. Johnson told the crowd that during his time working in retail at Apple he would often visit malls to assess possible Apple store locations. His team always parked at the department stores, he said, because there "weren't any cars." He then flashed on the screen a picture of the Minnesota-area Dayton's store he grew up visiting and waxed eloquent about restoring integrity to the department-store concept. The first significant change will be embracing a new pricing strategy, consisting of "fair and square" pricing. It includes three types: everyday, regular prices; monthlong values; and best prices, on the first and third Fridays of every month. To determine new prices across its product range, Mr. Johnson said that the retailer looked at what it was charging and what customers most often paid after numerous discounts. He found that only one in 500 items sold at full price, while 72% of revenue was derived from selling products at 50% off or more. For example, a T-shirt that had retailed for $14 but typically sold for closer to $6 will now be priced at $7. In a month when it's a featured product, it will cost $6. When it's time to clear it out and change colors, it will cost $4. The retailer is also embracing flat prices, no more 50- or 99-cent add-ons. The strategy will trim JC Penney's promotions to 12 a year from 590. In an homage to the promotional noise, presentation attendees walked down a hall plastered with old ads and circulars to the accompaniment of a raucous soundtrack that included a cat fight. Mr. Francis called it the "Hall of Hell." Instead of spending $2 million per promotion, Mr. Johnson said, JC Penney will spend $80 million a month promoting all its products. "Steve [Jobs] would have called this insanity," Mr. Johnson said of the sheer volume of promotions. "At some point you, as a brand, just look desperate. JC Penney spent over $1 billion, and the customer didn't even pay attention." Greg Clark, senior VP-creative marketing, told Ad Age the new approach will lead to an overall decrease in the retailer's ad budget. "Honestly, we just didn't need to spend as much when we shifted the strategy and stopped having to feed the 590-event animal," he said. "Now the media spend is more impactful, very aggressive and not spread so thin." New ads breaking today from Mother are a teaser for the revised pricing and an alert to the Feb. 1 launch date. They carry the tagline, "Enough. Is. Enough." Consumers throughout the spot scream when faced with sale signs, coupons and a mailbox overflowing with circulars and direct mail. A Facebook component includes a "No Meter" and consumers can work through "challenging" exercises to try to get a discount. Separately, a spokeswoman confirmed that Ruby Anik left the retailer late last year and that Mr. Clark is leading the creative and brand-marketing functions. Ms. Anik joined JC Penney in 2007 from Best Buy and had been the No. 2 marketer under former CMO Mike Boylson. Mr. Francis told Ad Age that he has no immediate plans to fill the CMO role, which Mr. Boylson left last summer. He said that the flatter structure has helped his team be more efficient but added that he reserves the right to tap an exec for the position later. The monthly promotional cadence is closely linked with the creative overhaul spearheaded by Mr. Francis. 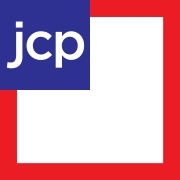 A new logo includes a square red frame, with "jcp" in a blue box in the top, left-hand corner. 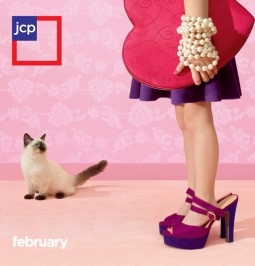 The frame will be used throughout JC Penney's stores and marketing. For overall tone and personality, the retailer looked to The Saturday Evening Post. Ads created by Peterson Milla Hooks are meant to feel fresh, warm, whimsical and American. JC Penney ended its relationship with longtime agency Saatchi & Saatchi in December. Working with PMH, JC Penney created a personality and color palette for each month that will be carried throughout marketing, in-store displays and even external lighting on stores. By focusing on one month at a time, Mr. Francis said, JC Penney can highlight important consumer events, such as Valentine's Day, Super Bowl or the Academy Awards. A 96-page perfect-bound book featuring relevant products will be mailed to consumers monthly, in addition to traditional newspaper circulars. "We have the opportunity to capture the consumer's imagination on a monthly basis," Mr. Francis said. "Owning the month is a significant opportunity for us." Mr. Johnson also highlighted the retailer's plans to return the department store into a store that actually has departments. In the coming months and years, shop-in-shops will be rolled out across brands and categories. Beginning in August, two to three shops a month will be rolled out for the next three and a half years, until JC Penney eventually operates with 100 unique shops. Mr. Johnson said 30 are actively in development. Martha Stewart's shop, slated to launch next year, is one of those. Ms. Stewart said that Messrs. Johnson and Francis' "entrepreneurial initiative" prompted her to want to work with JC Penney. She said she looked forward to working with the retailer in the coming years and didn't acknowledge the lawsuit Martha Stewart Living Omnimedia faces from Macy's . Meanwhile, Ms. DeGeneres will appear in five yet-to-be-revealed commercials and will promote the retailer on her show. JC Penney has no plans to sell Ellen products. Messrs. Johnson and Francis have accomplished a staggering amount considering they only officially joined the retailer in November and October, respectively. Mr. Johnson said he expects the transformation to be complete by 2015. The final piece of the puzzle is the prototype to launch in 2014. Next year, he said, the concept of the "Town Square" will be introduced. The common area won't involve selling and will usurp the area traditionally reserved for jewelry and cosmetics. "We're fine with growing old. We're not fine with growing stale," Mr. Johnson said, citing the company's new mission statement. "We're rethinking and reimagining, and if we find that we've picked up any bad habits over the decades, we're going to leave them far behind."